Summary: Lady Katherine Charlton has never forgotten the stable hand with dangerous fists and a troubled heart from her childhood. Now the rebel is back, his powerful anger concealed under a polished and commanding veneer. When ten years of scandal and secrets are unleashed, with a passionate, furious kiss, Heath's deepest, darkest wish crystallizes: revenge—and Kathy—will be his! Review: When I started to read this book, I had no idea that it was a modern retelling of Wuthering Heights until I read the letter the author wrote to the reader. I got really excited because Wuthering Heights is one of my favorite classics, so I had high expectations for this book. The story itself was sizzling and fun, but there were some problems I had with the book. First off, I really couldn't tell when this book was supposed to take place. The author used words like "trousers" and said he would "journey" to her house. This old language made me think it was more around the time Wuthering Heights was written, but then they used phones and cars, which made it seem like it was more recent, so I was really confused. The other thing that bugged me was how the author mainly used paragraphs describing thoughts and descriptions with not a lot of dialogue and action. So not a lot actually happened in this book aside from the romance between Katherine and Heath and even when things did happen, a lot of time was spent on describing how they felt and thinking about what the other person just said or did. If you ignore these two things, though, it was a nice read that was really quick to get through. Summary: Marina thought her dreams had come true when her husband placed a wedding band on her finger. But their marriage was not the fairy tale she'd hoped for, and eventually Marina walked away, her heart broken. Two years later Pietro D'Inzeo no longer haunts Marina's dreams. She knows the time has come to move on, and even a summons to join him in Sicily won't deter her…. However, with his wife standing before him, about to sign on the dotted line of their divorce papers, Pietro wonders why he ever let her go. I have 3 copies of this book to give away to my awesome followers! There will be one winners, so enter now to receive these great books! For each extra point, please leave another comment with a link! If everything is in one comment, it gets too confusing, so please make them separate! Thanks and good luck! I love Harlequin books! I actually got The Return of the Stranger last week since it sounded so good and interesting. I'll be reading it soon. ;) Thanks so much for the giveaway! The Proud Wife sounds awesome too! They sound good. 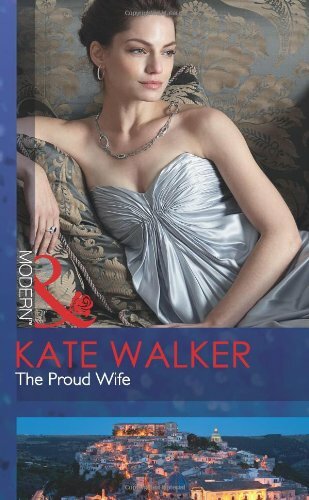 I especially like the cover of The Proud Wife. If Marina has matured in the two years of separation, how would Pietro be able to deal with the change? That would be very interesting to find out. The Proud Wife sounds to me a good read, especially when I am such a sucker for clean romances with various elements, including the exciting marriage of convenience.